Alpha, a powerful graphic novel in French by Bessora and Barroux, tells the story of a West African migrant who leaves Ivory Coast to find his family in France. 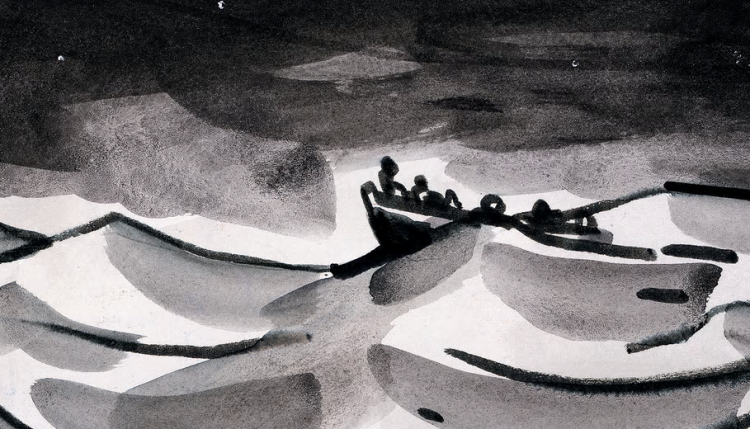 Thus unfolds a tragic, unforgettable tale about the hopes and perils of migration. Discover this story for yourself by joining our Spectacular Translation Machine – whether you’re a seasoned Francophone speaker or your knowledge extends as far as the dialogue of ‘Allo ‘Allo. Translation always involves at least four hands: those of the author and those of the translator. But we’re hoping for the people of Lancaster to roll up their sleeves and join us in the engine room of our machine. How can we bring the words spectacularly alive in English and for a new audience? With expert help on hand to guide us, including Alpha‘s award-winning translator, Sarah Ardizzone, this is suitable for everybody 14+. Tickets are free and are available to be reserved here. Alpha is published by Barrington Stoke in the UK, where it is supported by English PEN and Amnesty International, and has been nominated for the Carnegie and Kate Greenaway Awards 2017. Alpha: The Spectacle opened the Migrant Stories Strand at Edinburgh International Book Festival 2016 with the support of the French Institute. The Spectacular Translation Machine was first commissioned by the Southbank Centre in partnership with the British Centre for Literary Translation. Sarah Ardizzone is an award-winning translator and the co-founder of Translators in Schools.